Distracted driving: Are hands-free devices making things worse? Hands-free messaging systems were designed to help reduce the risk of car accidents caused by distracted driving, but a recent study revealed that they may actually do more harm than good. Hands-free devices are often touted as a solution to the nation’s burgeoning distracted driving crisis, but recent research suggests these gadgets may actually be contributing to the problem rather than solving it. A study commissioned recently by the AAA Foundation for Traffic Safety found that drivers who use voice-to-text messaging technology are more distracted than drivers who make calls using handheld cellphones. Voice-to-text systems are now being built into some new vehicles as car manufacturers look for ways to eliminate potential sources of distracted driving. According to the study, using a voice-to-text system creates a “large” amount of mental distraction for drivers, in contrast to the “moderate” or “significant” level of distraction caused by talking on a hand-held cellphone, the Insurance Journal reported. Listening to music or other audio recordings correlated with a “small” amount of mental distraction, researchers found. According to the research team that conducted the AAA study at the University of Utah, hands-free messaging systems eliminate some distractions while replacing them with new ones. Although voice-to-text technology may help drivers keep their hands on the wheel and their eyes on the road, using these systems may actually worsen drivers’ impairment by distracting too much of their attention and mental energy from the task of driving. By measuring drivers’ eye and head movements, brain activity and reaction times while exposing them to a variety of potential distractions, researchers found that interacting with voice-activated texting systems was more cognitively distracting than either listening to the radio or talking on a handheld cellphone. Drivers using voice-to-text systems were less attentive and more likely to overlook potential hazards on the road in front of them, according to the report. The recent study is not the first time that hands-free devices have drawn criticism from those who question their effectiveness at preventing distraction-related car accidents. 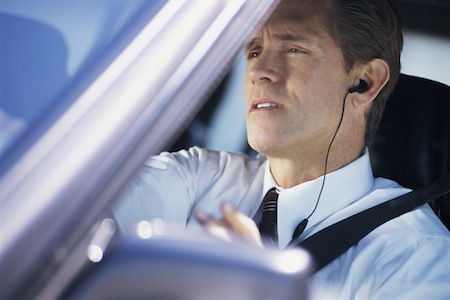 A 2009 study by the Virginia Tech Transportation Institute found that using a headset to talk on the phone while driving is not substantially safer than using a handheld cellphone. Ray LaHood, the outgoing U.S. Secretary of Transportation, has also publicly criticized hands-free systems, urging drivers to stow their cellphones out of reach in the glove compartment while driving. Likewise, the National Transportation Safety Board has called for a nationwide ban on cellphone use while driving, whether handheld or hands-free. Cellphone use and other forms of distracted driving in the U.S. contributed to approximately 387,000 injuries and 3,331 fatalities in 2011 alone, according to distraction.gov, a website maintained by the federal government. Distracted drivers who cause crashes resulting in injury or death can be held liable for the damage they cause, regardless of whether there are criminal charges involved. If you or a loved one has been hurt by a distracted driver, you may wish to consult with a personal injury lawyer in your area to learn about the possibility of pursuing compensation for your medical bills, lost income and other damage caused by the crash.